That is what is supposed to have happened after the Government announced in November 2010 that its goal would be to award 25 per cent of all contracts to SMEs. It even announced some reforms to help it achieve that target – notably a streamlining of the pre-qualifying questionnaires that bidders for public sector work must complete before even registering an interest in a contract. Sadly, however, the initiative isn't working. Just 7.8 per cent of government contracts went to SMEs during the third quarter of last year, with not a single government department coming anywhere near the 25 per cent target. At the Department for Business, which championed the goal, the proportion of contracts awarded to SMEs during the third quarter actually fell, to 13 per cent compared to 16.5 per cent in the previous quarter. Moreover, the reality of the data may be much worse than the headline figures suggest. Colin Cram, a specialist in public sector procurement, has just revealed a string of embarrassing disclosures made to him by the Department of Business on its 25 per cent target. Not only does it acknowledge that the target is an aspiration rather than a hard and fast policy, the department reveals that the 25 per cent only applies to central government contracts. This work accounts for just £65bn of the entire £236bn public sector spend. Worse of all, says Mr Cram, the figures just unveiled are not necessarily for contracts handed directly to SMEs. Departments are allowed to include contracts where SMEs feature somewhere in the supply chain. In fact, with that flexibility, it's quite an achievement to have kept the SME contract count so low. The suspicion must be that some departments are paying only lip-service to what was never a particularly impressive commitment in the first place. Although some of the bureaucracy involved in bidding for public sector work has now been eased, there are other ways to help SMEs get more of these contracts. In Scotland, public bodies have been given guidance on how to design tender processes so as to give SMEs a better chance of winning. At the very least, converting the 25 per cent target from aspiration into fully fledged policy would be an important signal of intent. Announcing that only direct contract awards count would be even better. OMG, which specialises in mobile motion capture – recording movements digitally – has unveiled two new contracts in the past few days. In a £2.27m deal with the Highways Agency, OMG's Yotta subsidiary will spend four years working to determine the condition of 140,000km of Britain's main roads. That contract win followed a deal to supply The Imaginarum with 80 of its specialist cameras. It will also be working with the studio, founded by the actor Andy Serkis (Gollum in The Lord of the Rings, right), and the film producer Jonathan Cavendish (best known for the Bridget Jones films). The deals could mark a turning point for IMG, which had a tough year in 2011, though it remained profitable. The stock now trades at 24p, a third more than a week ago, but still well off the 44p high of a year ago. Though it became fully operational last April, the Business Growth Fund has been taking its time to make investments. The fund is backed by Britain's five biggest banks but operates autonomously and has £2.5bn of capital with which to make investments of between £2m and £10m in fast-growing small and medium-sized businesses. In return, it gets a seat on the board plus an equity stake of at least 10 per cent. Until this month, the fund had made only three investments. Now there is a fourth, with BGF announcing it is putting £10m into Lincoln-based GCI Telecom Group. Founder 12 years ago by Wayne Martin, who still runs the business, GCI's telecoms and data services are producing annual revenues of close to £70m. BGF is taking a minority stake – the exact stake is undisclosed – and has also installed the telecom industry veteran John Cronin on the board of GCI as non-executive chairman. The downturn hasn't necessarily been bad news for everyone, particularly if you're a business exposed to the way in which people are now so much more determined to get the best possible price. One thing we've found over the past two or three years is that everyone is after deals all the time – it used to be that people knew they would get cheaper tickets if they booked well in advance, but now they expect that all the time. Price is everything – if people are not getting the best price, they're not going, and they're waiting to the last minute to make that decision. Our business has also been a beneficiary of the unpredictable weather and industrial action that has wreaked havoc on the airlines – the UK market was starting to get a little stagnant three years ago, but the ash cloud was a huge boost for us and that has kept on going. DUBAI, June 17 (Reuters) - Saudi Arabia's main stock index rose on Sunday, recovering the previous day's losses as the death of the kingdom's crown prince ceased to have an impact. Qatar's index was again weak and Bahrain steady, while markets in the United Arab Emirates, Kuwait and Oman were closed for a religious holiday. Egypt was also shut for the country's presidential election. Saudi Arabia's benchmark rose 0.4 percent. It fell 0.3 percent on Saturday, having been down as much as 2.6 percent intra-day in a knee-jerk reaction to Crown Prince Nayef's death eight months after he became heir to the throne. The index is now down 14.8 percent from early April's 3-1/2 year peak, as declines in oil and world equity prices have spurred local selling. "Yesterday's volatility was to be expected when we have this kind of news, but the market then recovered and I don't think it will be major factor today - Prince Nayef was known to have had health problems so his death wasn't a complete surprise," said a Riyadh-based fund manager, asking not to be identified. "The authorities will probably give some clarity on the succession soon and today's trading will be more linked to what's happening outside the region." Although Nayef was known for his strong management of security issues in the country, analysts see no reason to think foreign or political policies, much less economic policies, will change under his successor. Gains in world markets on Friday helped support Saudi sentiment. Investors fear Sunday's Greek elections could unleash fresh turmoil in the euro zone if the next government in Athens scraps Greece's bailout deal, but this is offset by hopes that the world's major central banks will make a coordinated response to ease any market dislocation. In Saudi Arabia, shares in telecoms operator Etihad Etisalat (Mobily) climbed 2 percent and Saudi Basic Industries Corp rose 0.8 percent. Saudi firms are expected to start announcing second-quarter earnings from early July. "Q2 results will help at least to stabilise the market, but these will be of secondary importance compared with what's happening in Europe, which is flitting between risk-on and risk-off mode," said the fund manager. "We should see some buying in select names ahead of results, particularly petrochemicals - people are expecting bad results, but not as bad as recent price movements would justify." The petrochemicals index climbed 0.4 percent, trimming its year-to-date losses to 4.7 percent. The sector has loosely tracked declines in oil prices, with crude seen as a key indicator for both petrochemical product prices and likely demand. In Doha, the main index slipped 0.01 percent to its lowest close since Oct. 6. This took its 2012 losses to more than 6 percent, making it the worst performing Gulf Arab benchmark. About 1.83 million shares traded, the lowest total since July 2011. "Volumes have been going down lately and I don't think it will get better anytime soon," said a Doha-based trader on condition of anonymity. "Foreign investors have been selling aggressively to invest in other markets and Qatar trading has slumped - things look anaemic, with a lack of catalysts and better opportunities for investors elsewhere." Vodafone Qatar fell 0.3 percent. The loss-making telecommunications operator is among the top-performing Doha-listed stocks this year, rising nearly 20 percent, but has fallen 2.5 percent since June 7, when it reported a fourth-quarter net loss of $35 million, missing an analyst's estimate. NBK Capital last week cut its rating on Vodafone Qatar to hold from accumulate. * The index rose 0.4 percent to 6,754 points. * The benchmark slipped 0.01 percent to 8,251 points. * The measure rose 0.1 percent to 1,132 points. Since the start of the global economic crisis in 2008, financial education has been under increased scrutiny from those dissecting what went wrong. Who, after all, had trained the perpetrators of the crisis? Were the “masters of the universe” ever taught about ethics? And if not, why not? Training in Islamic finance, which was already gaining in popularity pre-crisis, has grown from strength to strength, as it has developed a reputation as a haven of common sense and relative security in uncertain times. At least two of the causes of the crisis – gharar (risk) and gambling – are banned by sharia (Islamic law). She says that religious beliefs, not limited to Islam, can help leaders be more responsible in business. “The belief in God, and that absolute ownership of everything is solely His, brings with it an acute level of responsibility and accountability based on the notion of stewardship, which is equally placed on each individual, given that all mankind is believed to be equal before God. This “notion of stewardship” or khalifa, common to all Abrahamic faiths but particularly central to Islam, overlaps considerably with corporate social responsibility and transparency, two areas that have enjoyed a post-crisis boom. Dr Abdelsalam says khalifa manifests itself in Islamic businesses “through fulfilling social responsibility of the business to the best of its capabilities, including fair treatment of employees, care for the environment and customers, and fulfilling the obligation towards shareholders and other stakeholders, through wise use of financial resources”. At Aston, the Masters in Islamic finance encourages students to think about ethics in every module, be it accounting, contract law, or conventional finance modules. Cedomir Nestorovic, a professor of Islamic business and management at the Singapore campus of Essec, a French business school, agrees that Islamic finance courses need to address these issues. Prof Nestorovic adds that elements such as marketing and management must also become more integral parts of Islamic courses, so that they increase their breadth. One criticism aimed at Islamic finance instruments and banks, or Islamic finance divisions within conventional banks, is they do not embrace the spirit of sharia, but try to find ways round it, in an emulation of conventional finance. “There is a trend to consider Islamic finance as a ‘cosmetic’ industry where products and services are conventional ones with an Islamic veneer, the only purpose to obtain clearance from thesharia board,” says Prof Nestorovic. The danger is that Islamic finance, in trying to become more popular, loses its firm roots in religion and ethics. Some Islamic scholars, adds Prof Nestorovic, “consider that Islam finance does not exist because riba (interest, banned under sharia) is embedded in contracts, even if it is not labelled as such”. “There is also a certain disagreement between Islamic countries about the definition of a tangible asset and some accounting principles. “All in all, there is a gap between what is taught and realities for a certain number of observers,” says Prof Nestorovic. Confidence levels in the small business sector in Wales are the lowest of any nation or region in the UK, according to new research published today by the Federation of Small Businesses. The FSB’s latest Voice of Small Business Index for Q2 of this year shows in Wales a net balance on business confidence of minus 12 points – representing a two point improvement on the position in Q1. However, despite a narrowing of the gap between negative and positive outlook responses, Wales swaps places at the bottom of the leaguetable with Northern Ireland, which saw its negative balance improve markedly from minus 33 in Q1 to minus 6. In terms of confidence the north-east of England have the most upbeat small firms, with a net positive balance of 16 having been minus nine in Q1. In Scotland, although still in positive terrain, the positive outlook fell from plus nine to plus 4. In the south-west of England it was up 1 point to plus 10. As well as Wales and Northern Ireland there were also negative balances in London, the Midlands and Yorkshire & Humberside, while for the north-west it was neutral. Despite pressures, UK-wide confidence just remains in positive territory at plus 1.3, down 0.9 points on Q1. The survey was conducted before George Osborne’s £100bn liquidity plans for the economy announced in his Mansion House address last Thursday. The FSB wants his Funding for Lending Scheme to provide cash to those firms that need it, with a clear reporting process so that tangible evidence is given to show the money is being passed on to small firms and not just shoring up the banks. Janet Jones, Welsh Policy Unit Chair for the Federation of Small Businesses, said: “Overall, the Small Business Index across the UK remains in positive territory, despite a slight decrease since Q1 and despite still only being mildly above zero. “Although business confidence has not risen as sharply in Wales as in other parts of the UK – meaning we are reporting the worst business confidence – the slight increase does show signs of improvement whilst other parts of the UK have seen a marked drop. “The index highlights serious constraints to growth, notably access to finance, with many small firms still finding it difficult to access credit which can result in them missing growth opportunities. “Access to capital is an absolute necessity and the Welsh and UK Governments must give serious consideration to giving small businesses realistic alternatives to bank finance. The research found that than four in 10 (41%) small firms were refused finance from high street banks as confidence dipped in the second quarter. However, despite the credit squeeze, more than 50% of respondents said they still plan to grow their businesses over the coming 12 months. But the proportion of firms looking to grow rapidly shrank from 10.9% Q1 to 7.2 % in Q2. With one in five firms saying access to finance is the main barrier to achieving growth aspirations, the FSB believes the credit squeeze will impair small businesses’ growth plans, reduce new job creation and further set back the UK’s struggle to emerge from recession. Of 17 industry sectors measured, confidence fell in all but two. Confidence rose moderately in health and social work related firms, as well as vehicle sales and maintenance companies. All other sectors reported a fall with financial and real estate services showing a dramatic decrease. There were further sharp falls in retailing, leisure, sports and entertainment, as well as hotels and the restaurant and bar trade. A moderate decline in confidence was reported in manufacturing, IT and other business services. The Welsh government is looking at how devolved public sector bodies could be encouraged to become 'living wage' employers. 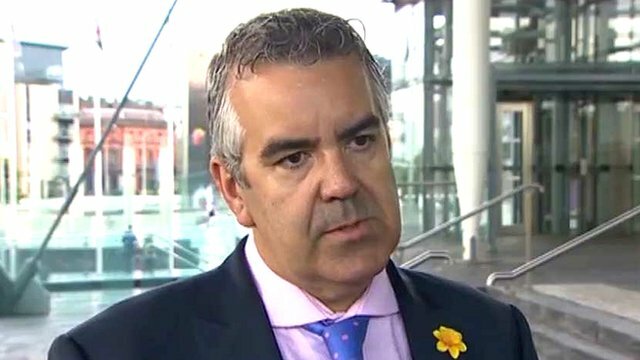 Business leaders have warned the Welsh government not to push for private sector pay rises as ministers investigate public sector wage levels. Labour has a manifesto commitment to find ways of making sure all Welsh workers are paid a "living wage". Business groups say it may stop firms taking on staff or even mean layoffs. The Welsh government says it is beginning to examine how devolved public sector employers can be encouraged to pay a living wage. A policy group of interested parties is expected to meet over the summer. Academics at Loughborough University have estimated a living wage is at least £7.20 an hour. The current statutory minimum wage is £6.08 an hour for workers aged 21 and over. Welsh NHS workers and Welsh government civil servants are already paid at least the living wage. A number of big private sector employers, including Barclays Bank and accountants KPMG, are also signed up to paying it. But business organisations warned Welsh ministers not to try to force them to raise wages, for example by inserting living wage clauses in government contracts. Robert Lloyd Griffiths of the Institute of Directors said he was concerned the living wage would effectively become the new minimum wage. "Businesses would like to take on more staff and lots of companies that I talk to would love to be in a position to be able to take on more employees," he said. "It's very difficult out there and anything that now will hinder them from doing that, which they'd like to do, is going to cause problems. "I'm afraid it just isn't realistic in the environment we live in." Anna Milewski, of the Federation of Small Businesses, said: "We have to look at it from the employers' perspective, we've surveyed them. "They say that an increase can, at best, deter them from taking on staff at worst actually result in them laying off staff, which would not be a positive outcome, of course." The Welsh government said: "Unlike the minimum wage, the living wage is not statutory. "However, any employer in the UK is free to sign up to the Living Wage Foundation's campaign. The Welsh government is starting to look at how devolved public sector organisations have been engaging with the idea and what it would take to encourage those organisations to become living wage employers. "This is a key reason the Minister for Local Government and Communities [Carl Sargeant] has decided to set up a policy group, so that consideration of the benefits, in much the same way as they were in London, can be given collaboratively. That group has yet to be brought together, but it is anticipated that this will happen over the summer." Labour AM Julie James said: "If we're the trailblazers we hope the private sector won't be so frightened of it and will actually see the benefit of a workforce which when they're happy and healthy work harder, stay longer, are more and actually do better work. So it's a win win, really." Young campaigners, working with Save the Children, recently petitioned the assembly for a living wage above the minimum wage. Iram Shahzad, a 13-year-old pupil at Fitzalan High School in Cardiff, told BBC Wales Sunday Politics that people in her community were working long hours but not earning enough money to cover their everyday essentials. "It's not fair that they don't get to live a happy life," she said. James Pritchard, head of Save the Children in Wales, said a living wage would be a "direct way of starting to tackle child poverty". Sunday Politics is on BBC One Wales at 12:00 BST. TOKYO: TOKYO: Tokyo stocks jumped more than two per cent in early trade on Monday as investors applauded results from Greek polls, with the two main pro-bailout parties clinching enough votes to form a government. The Nikkei 225 index at the Tokyo Stock Exchange was trading 2.23 per cent higher, or 190.77 points, at 8,760.09 in the first minutes of trading. The results also sent the euro higher in early Asian trade, as fears eased that a vote for anti-austerity parties could see Greece renege on its commitments under an international bailout plan, and ultimately exit the eurozone. The single currency was buying $1.2715 and 100.75 yen, up from $1.2644 and 99.47 yen in New York trade on Friday. Greece's conservative New Democracy party emerged as the frontrunner in Sunday's polls, paving the way for a pro-bailout coalition government. "The Greece election results were a net-buy incentive for stocks," Kenichi Hirano, operating officer at Tachibana Securities, told Dow Jones Newswires, but added that "Greece's problems are far from over, however". Markets are also awaiting details on Spain's 100-billion-euro ($125 billion) bank bailout, while investors are keeping an eye on a Group of 20 summit in Mexico this week and a US Federal Reserve policy meeting, dealers said. Tokyo shares were also buoyed after gains on Wall Street, with the blue-chip Dow Jones Industrial Average adding 0.91 per cent on Friday to 12,767.17. Australian shares gained 1.46% at the open Monday and the Australian dollar surged against the greenback after Greece's two largest pro-bailout parties won enough seats to form a government. At 10:13am (0013 GMT) the benchmark S&P/ASX200 index was up 59.1 points at 4,116.4 while the risk-based Australian dollar was trading at 101.26 US cents early in the session, up from 100.16 cents on Friday. "The Greece election news is likely to shore up risk assets across the Asian region today and lure in some cash which had been on the sidelines ahead of the elections," said IG Markets analyst Stan Shamu. "The question now is how long will the euphoria last." Sunday's crucial election was the second in six weeks in Greece after May 6 polls failed to produce a government, stirring fears that the political stalemate would paralyse efforts to bring Greece back from the brink. The conservative New Democracy party, which backs a European Union-International Monetary Fund bailout for Athens, declared victory. Meanwhile, the euro soared in early Asian trade on Monday, with markets breathing a sigh of relief after Greece's two main pro-bailout parties clinched enough votes to form a government in tight polls. Tension had been mounting up to the vote with the single currency hitting multi-month lows in recent weeks, but on Monday the euro was buying $1.2739 and 100.75 yen, from $1.2644 and 99.47 yen in New York trade on Friday. The vote in favour of parties that backed a European Union-International Monetary Fund bailout for Athens came amid a wave of anti-austerity sentiment, with fears growing that the debt-hit nation may renege on its commitments and ultimately leave the bloc, dealing a significant blow to the whole region. Athens has been forced to seek bailouts twice in recent years amounting to about 347 billion euros ($442 billion), and European leaders warned Greece it must respect its international debt commitments or risk leaving the euro club. Despite the reprieve offered Sunday, analysts warned that it would not vanquish concerns about the embattled eurozone or Greece's economic future. "There are still many question marks over Greece's ability to adhere to the package it has signed up for and the very real economic weakness that its economy is facing," John Horner, a Sydney-based currency strategist at Deutsche Bank, told Dow Jones Newswires. "The medium-term questions remain very much in place." Antonis Samaras, the leader of the conservative New Democracy party, which preliminary official results showed in the lead with 30.04 per cent, said after the vote that "the country does not have a minute to lose." "We ask all political forces which share the aim of keeping the country in the euro... to join a government of national unity." Samaras's main rival Alexis Tsipras, head of the leftist anti-austerity party Syriza, who had said a victory would mean renegotiating the rescue plan or tearing it up, conceded defeat and ruled out joining any coalition. The EU and IMF pledged support to the next Greek government. "We are hopeful that the election results will allow a government to be formed quickly," said the presidents of the European Council and the chairman of the European Commission, Herman Van Rompuy and Jose Manuel Barroso. "We will continue to stand by Greece as a member of the EU family and of the euro area," they added, in a statement issued in the Mexican town of Los Cabos on the eve of the G20 summit of the world's leading economic powers. A short statement from the International Monetary Fund indicated it will set about a renegotiation of Greece's 130-billion-euro bailout programme. "We take note of the election results in Greece and stand ready to engage with the new government on the way forward to help Greece achieve its objective of restoring financial stability, economic growth and jobs," it said. In other Asian forex trade, the dollar climbed against the Japanese currency to 79.09 yen from 78.67 yen. Asian stocks advanced and the euro strengthened as projections showed politicians that support Greece’s bailout won enough seats to control parliament, easing concern the currency bloc would lose one of its 17 members. Oil rallied while treasury futures declined. The euro extended last week’s 1 percent jump against the dollar, and U.S. stocks were poised to add to a weekly rally, as the New Democracy and Pasok parties took 162 seats in the 300- member parliament, according to the official projection by the Interior Ministry in Athens based on 95 percent of the votes. The results eased concern that Alex Tsipras’s Syriza party would take control of the Greek government and reject austerity measures needed to qualify for international aid. The vote forced Greeks, in a fifth year of recession, to choose open-ended austerity to stay in the euro or reject the terms of a bailout and risk the turmoil of exiting the 17-nation currency. The election threatened to dominate a summit of world leaders in Mexico. Leaders from the Group of 20 nations will boost the $430 billion firewall the International Monetary Fund announced in April, host President Felipe Calderon said. European governments indicated a willingness to adjust the terms of Greece’s bailout package as long as a new government “swiftly” emerges from closely fought election. Exporters led stock gains. Toyota Motor Corp. jumped 3.3 percent to 3,095 yen, the highest since March. South Korea’s Samsung Electronics Co. advanced 2.4 percent to 1.246 million won in Seoul. BHP Billiton Ltd., the world’s No. 1 mining company, increased 2 percent in Sydney. More than $5 trillion has been erased from stock prices around the world since March, with benchmark indexes in Brazil, Russia and Italy falling into bear markets, or losses of 20 percent or more from recent peaks. The MSCI Asia-Pacific has lost 11 percent from this year’s highest level in February. The S&P 500 may extend gains following its first back-to- back weekly advance since April amid speculation central banks will take steps to stimulate growth in economies threatened by Europe’s debt crisis. The index lost as much as 9.9 percent from a four-year high on April 2 through June 1. It has rebounded 2.8 percent since then after the slump dragged its valuation to 12.9 times reported earnings of its companies, the cheapest since November, according to data compiled by Bloomberg. Greece was left with a political stalemate after the previous election on May 6. Since that vote, the euro weakened 4.8 percent against the yen and lost 3.4 percent versus the dollar through last week as investors sought havens from the turmoil. The crisis escalated on June 9 when Spain asked for a bailout of as much as 100 billion-euro ($127 billion) to prop up its banks. Through most of the financial and political turmoil in Europe, the euro has held above its lifetime average of about $1.21 as investors put their faith in German Chancellor Angela Merkel to keep the monetary union in place. While forecasting little change in the euro versus the dollar, a majority of the world’s biggest foreign-exchange trading firms surveyed last month by Bloomberg News said the loss of a member such as Greece would risk more departures and send the currency lower. The median year-end estimate for the euro is $1.25, according to more than 50 analyst estimates compiled by Bloomberg. The forecast has come down from $1.30 as recently as May 18. The S&P GSCI Index of 24 commodities has tumbled 19 percent from its 2012 high in February. Oil for July delivery advanced as much as $1.57 to $85.60 a barrel, the highest intra-day price since June 11, and copper futures in New York gained as much as 2.7 percent to a three-week high. Gold futures lost 0.5 percent as demand for a haven diminished. Yields on benchmark 10-year U.S. Treasury notes and German bunds reached all-time lows this month of 1.44 percent and 1.13 percent, respectively, as investors pursued assets considered to be the safest. Spain’s 10-year yield reached a euro-era record of 6.998 percent last week after the nation sought a bailout for its banks. The 10-year Treasury yield decreased six basis points to 1.58 percent last week after jumping 18 points in the previous week. The German 10-year yield increased 27 basis points in two weeks, ending at 1.44 percent on June 15. Declines since February are threatening to erase a rebound in the Euro Stoxx 50 (SX5E) Index since the gauge reached 2 1/2-year low nine months ago. The measure of stocks in countries that share the common currency has lost 16 percent since March 19, led lower by a 53 percent tumble in Nokia Oyj (NOK), a 38 percent retreat in UniCredit SpA and a 34 percent loss in Repsol SA. Concern Europe’s debt crisis would slow economies and trigger bank losses has spurred the three biggest declines in global equities since they reached a six-year low in March 2009. The MSCI All-Country World Index tumbled 16 percent between April and July 2010, fell 24 percent from May through October 2011, and has declined more than 9 percent since reaching a seven-month high of 337.14 on March 19, data compiled by Bloomberg show. Spain’s IBEX 35 Index (IBEX) has lost 40 percent since peaking in February 2011, reaching a nine-year low on June 1, while Greece’s Athens Stock Exchange General Index (ASE) has plunged 90 percent since October 2007. Optimism among global asset allocators “collapsed” this month as Europe’s debt crisis prompted money managers to sell equities and hoard cash to the highest level since 2008, a Bank of America Corp. survey showed. Respondents managing $522 billion reduced their holdings in stocks to underweight for the first time in seven months, meaning they now own less than are represented in indexes. Cash balances surged to 5.3 percent in June, the third- highest level on record, while an index of risk and liquidity sank to 30, the lowest level since September 2011. Expectations for global growth also deteriorated, with a net 11 percent now expecting growth to slow, the survey showed. That compares with 15 percent last month who said they expect a stronger economy. Even after rallying 77 percent in just over three years, the MSCI All-Country World Index (MXWD) is trading for 13.4 times annual profit, about 35 percent below its average valuation since 1995, according to data compiled by Bloomberg. The S&P 500 is priced at 13.6 times earnings, compared with the average of 16.4 since 1954, the data show. The decline in equities during the second quarter has corresponded with an increase in the cost of options to protect against losses. The Chicago Board Options Exchange Volatility Index, a gauge derived from equity derivatives linked to the S&P 500, increased 36 percent since the end of March, the first quarterly increase since it rose 160 percent from June through September 2011. At 21.11, the VIX is less than 1 point above its two-decade average. The euro extended last week’s 1 percent jump against the dollar, and U.S. stocks were poised to add to a weekly rally, the New Democracy and Pasok parties took 162 seats in the 300-member parliament, according to the official projection by the Interior Ministry in Athens based on 95 percent of the votes.